Applications can be submitted via the online application form. If you are only replacing an existing driveway then you are required to book for a site inspection through the online application form to lodge for the final formwork/sub-base assessment of the driveway across the verge prior to pouring the concrete/asphalt and applying the surface finish. Where do I find the application form? TCCS has a maximum assessment time of 15 working days. What part of my driveway is owned by the Territory? The driveway from the road to the property boundary is on Territory land and is owned by the Territory. Will the Territory construct a driveway on behalf of the property owner? Design and construction of all new or modified driveways, including relocated driveways, is the responsibility of the lessee. All costs associated with the design and construction work will be the responsibility of the lessee. Do I require inspection of my driveway? Yes you do. You are required to contact TCCS Development Review and Coordination and organise an inspection prior to pouring the concrete or placing the top surface layer (asphalt/pavers) for the driveway. TCCS require a minimum of 48 hours notice for booking an inspection. To make a booking please phone 6205-8084 or 6207-7386. What are the standards or requirements for building a driveway? TCCS Design Standard DS-05 (PDF 193KB) outlines any requirements for design and construction of driveways including size, grade, clearances and materials. Can I construct a second driveway? There is one driveway and kerb crossing for each block. Provided all other provisions below are met, a second driveway and kerb crossing over the verge may be permitted. total proportion of the width of the access relative to the building width: 5 metres at kerb and 3.5 metres at property boundary etc. 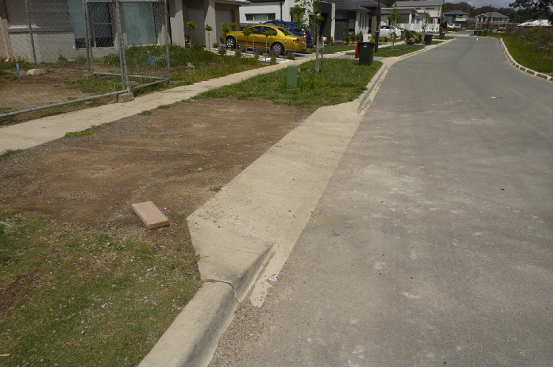 You may construct a second driveway, subject to TCCS' conditions for a second driveway which are located in the Territory Plan and TCCS Design Standard for 5 Driveways DS-05 (PDF 193KB). What materials are acceptable for driveway construction? 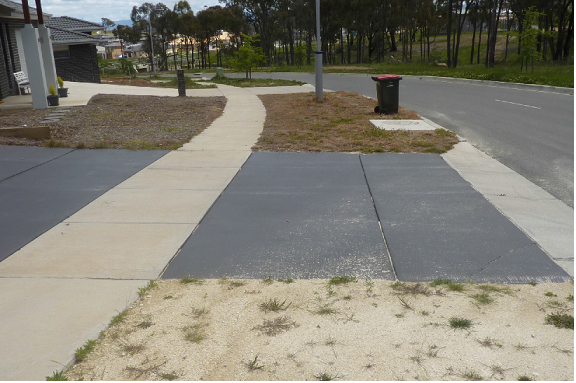 Plain coloured or stamped concrete, bitumen or pavers are acceptable driveway materials. Exposed aggregate will be allowed under special circumstances on request. Polished concrete and tiled finishes are not permitted. What is a vehicle crossing? The vehicle crossing is the section of kerb that has been removed and replaced in concrete to allow easy vehicle access from the road. Refer to Figure 1. Figure 1 - Vehicle crossing in kerb, between the road surface and the first expansion joint. What is the maximum gradient for a driveway? Maximum upward gradient for a driveway on the verge is 17%. Maximum down grade is 12%. Variations to the design of the driveway in different situations are covered in Design Standard DS-5 (PDF 193KB). These maximum grades are required for the safe operation of the driveway. Refer to Figure 2. Figure 2 - Driveway grade. What are the Territory's minimum and maximum widths at the property boundary and kerb? Two or three dwelling units with provision to turn around inside the property so that exit is in a forward direction. Two or three dwelling units with no provision to turn around inside the property so that exit is usually in a reverse direction. Note this is no longer allowed for new developments. Note 1: Single dwelling driveways that do not meet the standard driveway widths may be supported subject to justification such as matching existing streetscape or in locations where the front boundary is less than 12 metres in width. Note 2: The maximum width at the property boundary and kerb line will only be supported where the driveway is serving a double or larger garage, or multiple dwelling; in all other cases the maximum is to be as per the standard driveway type R.
I have a double garage; can I widen my vehicular crossing to suit? Standard driveway width at the kerb can only be increased to a maximum 5.5 metres to accommodate construction of a double garage providing all clearance requirements are met. What strength concrete is used for a standard residential driveway? Concrete strength is 32 mpa for a standard residential driveway. When is a standard or industrial strength driveway required? Standard driveways are for residential dwellings up to three units. Residential dwellings of four or more units and commercial or industrial dwellings require an industrial strength driveway. How do I get approval for an industrial driveway? Industrial driveway approval is by way of a Design Acceptance submission. 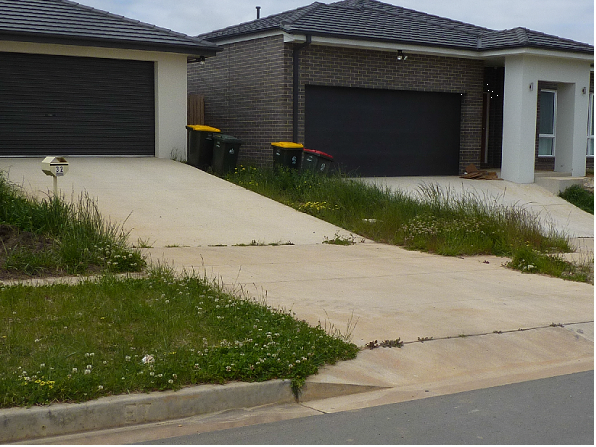 In normal circumstances an industrial driveway should have a Development Application lodged with ACTPLA. TCCS requests a Design Acceptance obtained from the Senior Manager, Development Review and Coordination for any off site works including driveways in accordance with the approved Notice of Decision of the Development Application. I have a footpath running through my driveway. Can I remove the footpath to construct a new driveway? We encourage you not to remove the footpath when building a new driveway. However you are allowed to remove the footpath and reconstruct it as long as the new footpath section is constructed to TCCS standards DS-05 (PDF 193KB). Refer to Figures 3 and 4. 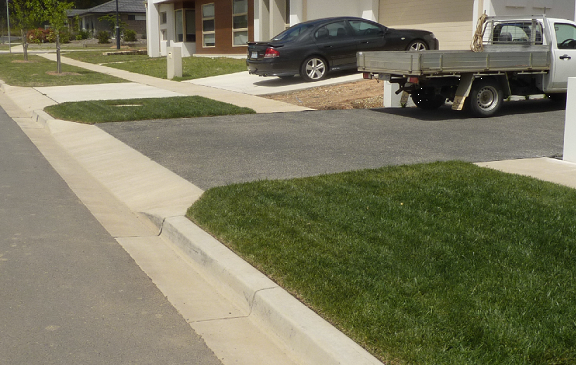 Figure 3 - This driveway shows incorrect footpath priority. Footpath must have priority over the driveway. Figure 4 - Driveway with correct footpath priority. I have an approved Development Application (DA) for either single or dual occupancy. Do I need to lodge an application to TCCS for the design approval of my driveway? Your design would have been approved as part of your DA application. However you still need to lodge an application for a formwork inspection through the online application form. There is a tree close to my proposed driveway. Can I still construct the driveway in that position? The driveway must be located at least three metres from the outside of the trunk of any existing new or small tree, and outside of the drip line of mature street trees. However the ACT Government may approve variations to this requirement upon application. If you need any further help with the on-line application form or application please contact Access Canberra 13 22 81 and ask for TCCS Development Review and Coordination. Below is a list of definitions used in this document and by ACT driveway inspectors and builders. The paved area between the road kerb and the property boundary where a vehicle can access a property. The section of land that includes the carriageway and nature strips on both sides of the carriageway, usually measured from property boundary to property boundary. The section of the kerb that has been removed and replaced in concrete to allow easy vehicle access. Concrete strength, in mega-pascals, after 28 days in accordance with Australian Standard AS1379. The rate of longitudinal rise or fall of a driveway – usually expressed as a percentage. Wooden (sometimes steel) boards used as a mould to contain fresh concrete in the correct position. The formwork is removed once the concrete has cured (hardened). A graded rock material used to create a base for roads and driveways. The area of the road reserve between the kerb and the property boundary.